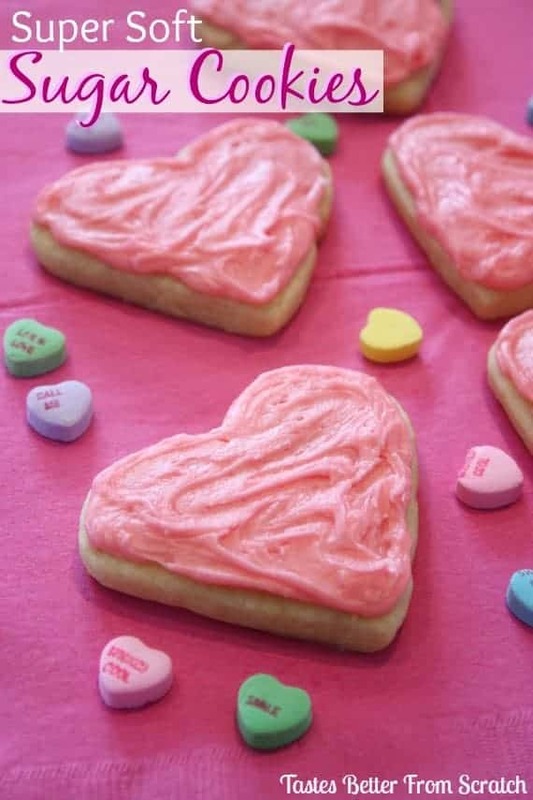 Super Soft Sugar Cookies are the perfect treat for Valentines of for any occasion all year round. They don’t have to be shaped like a heart. I’m just not okay choking down boring, flavorless, dry sushi, or sugar cookies! All sugar cookies use the same basic ingredients, and all sushi rolls uses the same basic ingredients, but depending on the recipe/who makes them they can be fantastic or totally boring! There’s nothing worse than biting into a hard, dry and flaky sugar cookie! It’s a very personal thing but for me, sugar cookies absolutely have to be super soft, light, and covered in yummy frosting! Somebody please tip my husband that he can forget the flowers and chocolate this year— all I want is a batch of these amazing cookies! 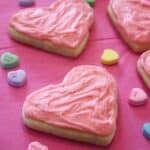 Super Soft Sugar Cookies are the perfect treat for Valentines of for any occasion all year round. In a medium size bowl, cream together shortening and sugar. Add eggs, milk, and vanilla. In a separate bowl, mix dry ingredients (flour, baking powder, and salt). Slowly mix dry ingredients into the wet mixture until you form a large dough ball. Cut the dough into shapes using a cookie cutter. Place cookies on a lightly greased cookie sheet. Bake at 350 degrees for about 8-10 minutes. For the frosting, combine all ingredients in a large bowl and blend well until smooth. I doubled your recipe and made about a hundred heart shaped cookies this past week and can’t believe how moist and fresh they stayed all week. Thanks for sharing! I’m impressed. Thanks Kelly! Glad you liked them!! Even thought my Valentine is gone I still love sugar cookies. These look so yummy and can make them for my great granddaughter for Valentine Day. I want to try this sugar cookie – cut out recipe. It’s a little different from the last one I tried. I’m aiming for soft. Hi, Lauren. I was thinking of trying these cookies without the frosting. Would they be sweet enough? Or do you really need the frosting on these? Thanks. How many can we make using this recipe? Have you ever made this recipe with butter in lieu of shortening? Hi Jane, Although the butter would add a yummy flavor, I have found that the shortening in this recipe makes the cookies a bit more soft and chewy – a consistency that I really like. These are amazing!! A great recipe I will be using often from here on!